We will be starting a new product December first. This product is made of nearly 10 branded essential oils. 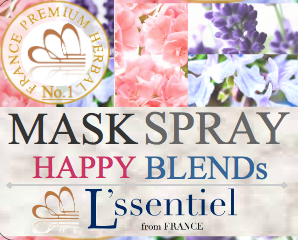 It name is [Happy Brends] , and it is spray for mask. Why don't you try to make the mask smell clean this season when there are many opportunities to use masks? The scent continues for about 2 hours. This product make you HAPPY!